And, now for something completely different: the interaction between one’s diet and one’s teeth from an anthropological perspective. According to the article dental anthropologists believe that there is a correlation between a modern or industrial diet of highly processed foods and malocclusions. (Malocclusion means “dental crowding with teeth out of alignment.”) Consumption of a diet of processed high-calorie and low-fiber foods occurs with the transition from indigenous or non-industrial culture to an industrialized culture and diet. What is not so clear is why this is so: is it genetics or is it diet or is it a combination of both? Nearly two-thirds of American’s have some degree of dental crowding while indigenous peoples subsisting on their native diets seem to have nearly perfectly aligned teeth with almost no crowding (Rose 2009:292). The trend seems to hold for the majority of societies that consume an industrialized diet of mostly soft processed foods. 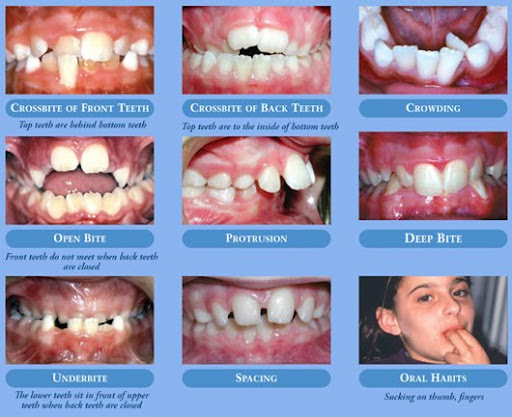 Traditional orthodontic textbooks attributed dental crowding to teratogens (agents causing birth defects), malnutrition, genetic disturbances or a genetic admixture of inherited genes and behaviors such as thumb sucking (Rose 2009: 294). But the hereditary cause of malocclusion proponed by the National Institute of Health doesn’t seem to be true (NIH 2009) according to the latest studies. The photos above are from IslandBraces.com via Google Images. The implications for orthodontic treatment is to treat dental crowding not with tooth extraction and orthodontics but rather with dentofacial orthopedics and orthodontics in order to increase alveolar bone growth during growth and development (Rose 2009: 297). A prescription for straighter teeth may also be a diet of more tough and fibrous foods for young children while their jaws are still developing. The reason is that foods that require more mastication seem to stimulate more alveolar bone growth in the maxilliary and mandibular dental bridges in both cross-cultural cross-generation studies and in animal studies, too (Rose 2009:296). Dental anthropologist Robert Corruccini gathered 20 years of research on the cross-cultural and generational differences in occlusial (alignment) anomalies and concluded that reduced chewing stress in childhood produced jaws that were too small for the teeth despite the ubiquitous trend in dental size and reduction since the advent of agriculture (Rose 2009:296). Corrucini reviewed several previously unpublished cross-cultural studies that showed a significant increase in malocclusion in younger generations who consumed a more refined commercial diet than that of their grandparents who consumed a traditional diet of coarser and more fibrous foods (Rose 2009: 296). Diet has long been associated with dental health. Weston Price’s 1939 cross-cultural study of 11 human diets titled Nutrition and Physical Degeneration: A Comparison of Primitive and Modern Diets and Their Effects were one of several early cross-cultural studies that pointed to traditional indigenous diets rather than inherited characteristics to be a greater contributing factor to general and dental health. Robert Corrucini, a dental anthropologist, labeled malocclusion as a “disease of civilization (Rose 2009:299).” Once again, it seems that a Western or industrialized diet characterized by processed, low fiber, high fat, and high sugar foods may be to blame for another modern health malady besides diabetes, heart disease, cancer, obesity and so on: crooked teeth. 1939 Nutrition and Physical Degeneration: A Comparison of Primitive and Modern Diets and Their Effects, La Mesa, CA: Price-Pottenger Nutrition Foundation, Pp. 524. 2009 “Origins of Dental Crowding and Malocclusions: An Anthropological Perspective,” Compendium of Continuing Education in Dentistry, June 2009, vol. 30., No.5., Pp. 292-300. This entry was posted in Diet, Paleoarchaeology by arkirwin. Bookmark the permalink.